586 min. NBC. Directors: Paul Feig, Jeffrey Blitz. Cast: Steve Carell, John Krasinski, Jenna Fischer, Rainn Wilson, Ed Helms. We've all been there. The American office park, with its copiers and cubicles and warehouses and delivery men, is a familiar place, whether we've inhabited it or just visited. As bleak as this landscape can be, it provides fertile ground for the "it's funny because it's true" comedy of recognition. In its fifth season on NBC, the American version of Ricky Gervais and Stephen Merchant's clasic Britcom The Office continues to trade on this recognition while delivering its own unique brand of alternatingly absurd and heartfelt character comedy. The Office has a bona fide comedy star in Steve Carell, a busy man who headlines movies (Get Smart, the upcoming Date Night with Tina Fey) between shoots for the series. 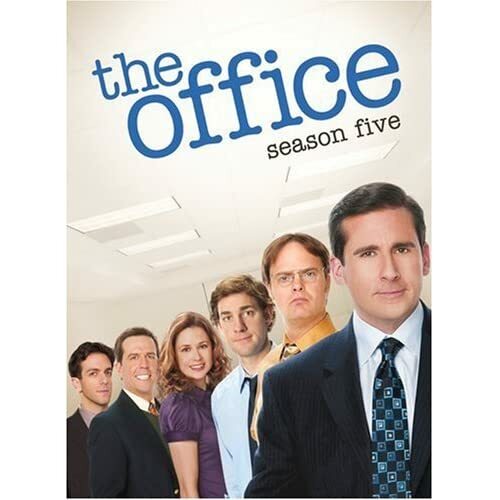 As Dunder Mifflin Paper Company's Scranton regional manager Michael Scott, Carell conspires with the show's writers to balance a character who, on the one hand, is the boss from hell—disruptive, emotionally needy, and blithely politically incorrect—and on the other hand posts top sales figures and shows loyalty and love to his employees when the chips are down. Much of The Office's narrative follows the ups and downs of Michael's career and love life. At season's start, Michael pursues his soul mate—HR officer Holly Flax (Oscar nominee Amy Ryan)—but their happiness depends on keeping their verboten office romance off the books. Later in the season, an underappreciated Michael languishes under a new supervisor (the great Idris Elba of The Wire, proving his deadpan comic chops), then defects from Dunder Mifflin in a dramatic career move that entangles Pam (think Jerry Maguire). The Office has the funniest ensemble of any sitcom on the air: bizarrely militant part-time beet-farmer Dwight (Rainn Wilson of The Rocker), preppy Cornell grad Andy (Ed Helms of The Hangover), lovebirds Jim (John Krasinski of Away We Go) and Pam (Jenna Fischer of Walk Hard), disgraced temp Ryan (B.J. Novak), emotionally messy Kelly (Mindy Kaling), tightly wound accountant Angela (Angela Kinsey), thick-skulled Kevin (Brian Baumgartner), hilariously weary Stanley (Leslie David Baker), put-upon but newly empowered Phyllis (Phyllis Smith), alcoholic Meredith (Kate Flannery), sane observer Oscar (Oscar Nuñez, a master of deadpan), brain-fried Creed (Creed Bratton), HR officer and born loser Toby (Paul Lieberstein) and savvy prankster Darryl (Craig Robinson), a frequent visitor from the warehouse. Novak, Kaling, and Lieberstein pull double duty in the writers room, and the show's top-notch directors include Stephen Merchant (co-creator of the British Office), Paul Feig (Freaks and Geeks), and Jeffrey Blitz (Spellbound). Season Five of The Office comes up with plenty of its customary week-to-week office lunacy (like the season-opening diet competition between branches and an absurd fundraising auction to compensate for a burgled office), but also serves several character arcs beyond those of the boss. Long-distance lovers Jim and Pam are waiting on wedding plans as Pam takes art classes in NYC; Angela and Andy continue to plan their wedding though she's secretly sleeping with "ex" Dwight; lovelorn loser Toby returns from Costa Rica to make Michael's life hell; and Ryan repeatedly weasels his way back into the paper world after spectacularly flaming out in Season Four. The show's writers are still capable of small-scale hilarity based on realistic office tensions (a lengthy debate over the hotness or notness of Hilary Swank) and, more often, broadly funny situations that no real company would abide at the workplace, like Dwight's near-deadly fire drill in the double-wide Super Bowl episode "Stress Relief." Apparently, quality control is still job one in this Office. 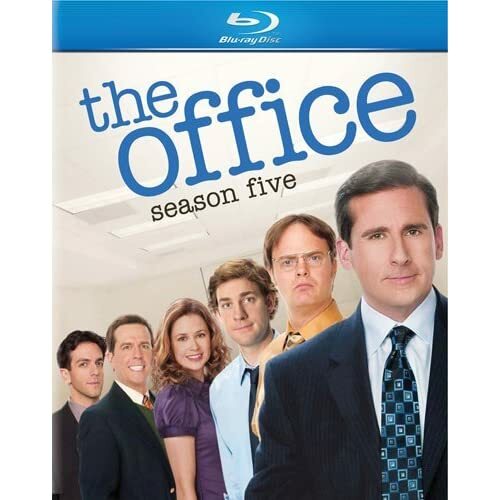 One of TV's most popular sitcoms makes its Blu-ray hi-def debut with The Office: Season Five. The picture quality is excellent, with generally sharp detail (especially impressive in the static-camera interview segments) and colors that pop off the screen. Videophiles squinting at their screens can quibble about minor, stray digital artifacts (no doubt attributable to the show's documentary shooting style and, thus, arguably intentional); to me these transfers pleasingly make the most of the hi-def source material. Lossless DTS-HD Master Audio 5.1 does the unusual job of enhancing sounds most series try to banish: because of the show's documentary style, the soundtrack captures the roughness of a crew working on the fly. Like the video, the audio accurately and effectively recreates the original broadcast experience. The set includes all twenty-six episodes (two of them double-length) and plenty more. As with previous sets, The Office: Season Five comes packed with bonus footage, including the "Producer's Extended Episode" for "Frame Toby." The season's deleted scenes total more than three hours of very funny material, tantamount to nine bonus episodes. Two webisodes add up to another episode's worth of material. Disc One includes a large portion of those "Deleted Scenes" (1:02:24, HD); "Weight Loss" Commentary with Randy Cordray, Michael Gallenberg, Brian Wittle, Nick Carbone, Ben Patrick, Alysia Raycraft, Kelly Cantley, and Jake Aust; "Business Ethics" Commentary with BJ Novak, Peter & Vartan, and Sergio & Alan; "Employee Transfer" Commentary with Dave Rogers, Anthony Farrell, Veda Semarne, Chuck Canzoneri, Kyle Alexander, and Phil Shea; and "Customer Survey" Commentary with Stephen Merchant, Paul Lieberstein and Mindy Kaling. The most valuable of these—for die-hard The Office fans—is the last, since it features witty and wise British Office co-creator Merchant. Disc One also includes a hi-def feature called One-Liner Soundboard, which allows the viewer to create special playlists from season soundbites and share them online via BD-Live. Disc Two has "Deleted Scenes" (1:07:37, HD); "Moroccan Christmas" Commentary with Kate Flannery, Angela Kinsey, and Brian Baumgartner; "The Duel" Commentary with Rainn Wilson, Rusty Mahmood, Jennifer Celotta, and Dean Holland; and "Dream Team" Commentary with BJ Novak, Aaron Shure, Charlie Grandy, and Matt Sohn. Disc Three includes "Deleted Scenes" (24:12, HD). Disc Four includes "Deleted Scenes" (40:30, HD); "Michael Scott Paper Company" Commentary with Jenna Fischer, Gene Stupnitsky, Lee Eisenberg, and Justin Spitzer; "Casual Friday" Commentary with Creed Bratton, Mindy Kaling, Ellie Kemper, Brent Forrester, and Claire Scanlon; and "Company Picnic" Commentary with Paul Lieberstein, Ken Kwapis and Jennifer Cellota. Also on hand are an extensive "Gag Reel" (14:48, HD); an entertaining greatest-hits montage called "100 Episodes, 100 Moments" (8:45, HD); and a section of The Office Promos: two ads for the "XLIII Football Championship" (2:31 with "Play All" option, HD) and four ads for the Beijing Games (2:08 with "Play All" option, HD). The two "Webisodes" (20:18 with "Play All" option, HD) live on Disc Four, as does the most substantial behind-the-scenes extra: "Academy Of Television Arts & Sciences Presents The Office" (30:02, SD). These special public programs never fail to fascinate. Andy Richter hosts the live onstage discussion with series developer Greg Daniels, Steve Carell, Rainn Wilson, BJ Novak, Mindy Kaling, Paul Lieberstein, Oscar Nunez, Angela Kinsey, editor David Rogers, John Krasinski, Jenna Fischer, Leslie David Baker, Brian Baumgartner, Phyllis Smith, Kate Flannery, Ed Helms, Creed Bratton, writer Jennifer Celotta, Craig Robinson, and director of photography Randall Einhorn. The discs also include the My Scenes bookmarking feature and the aforementioned BD-Live accessibility pointing to additional online content. Office fans can rejoice that one of their favorite series has made the leap—hopefully for good—to hi-def home video. All site content © 2000-2019 Peter Canavese. Page generated at 04/18/2019 12:14:49AM.